With Halloween right around the corner, it’s about time to make a big decision for your pet – what costume is he going to wear this year? The choices are endless and pet supply stores are stocked to the gills with cute hot dog, shark, and bumblebee costumes. And while your dog may look so adorable as a wookie or pumpkin, there’s only one outfit out there that’s going to keep him safe while you’re out trick-or-treating. You probably don’t think about coyotes when you think about Halloween – especially if you live in a big city – but they’re everywhere, and they want you to forget about them. Coyotes do their best to stay invisible until they attack, and when they do, they can run off with your dog in the blink of an eye. You may have covered your bases keeping your dog safe from Halloween chocolate, or pranksters, but don’t forget the real threat – coyotes. Predator Vest™ is the only costume out there that’s going to keep your dog safe from coyotes. It deters them from attacking by protecting your dog with spikes and bite-proof Kevlar around his neck and torso – the places a coyote would latch on to run off with him. You may feel that your dog is safe because you have him on a leash, or are with a noisy crowd, but coyote attacks have happened even in similar situations. Coyotes are stealthy and quick. As animals that tend to hunt at night, Halloween gives them an advantage. Pups are out with owners who are distracted with friends or kids. You may feel confident that you could protect your dog from a coyote, but by the time you see the coyote, it may be too late. Coyotes attack your dog in his most vulnerable areas with a crushing bite, and carry off prey to eat undisturbed. Even though they’re a threat, they’re still cousins to our dogs, and we prefer not to harm them. The best defense is keeping him from attacking in the first place. 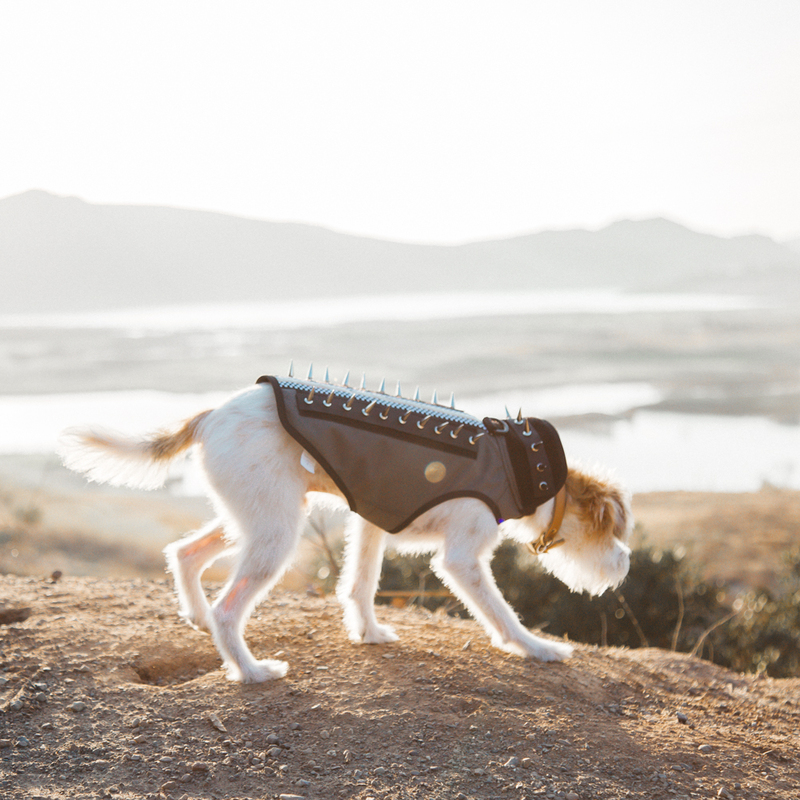 Predator Vest™ keeps coyotes away by making it difficult to find a place to even grab your dog. Should any coyote choose to target your pet, you’ll have an advantage because he’s protected. 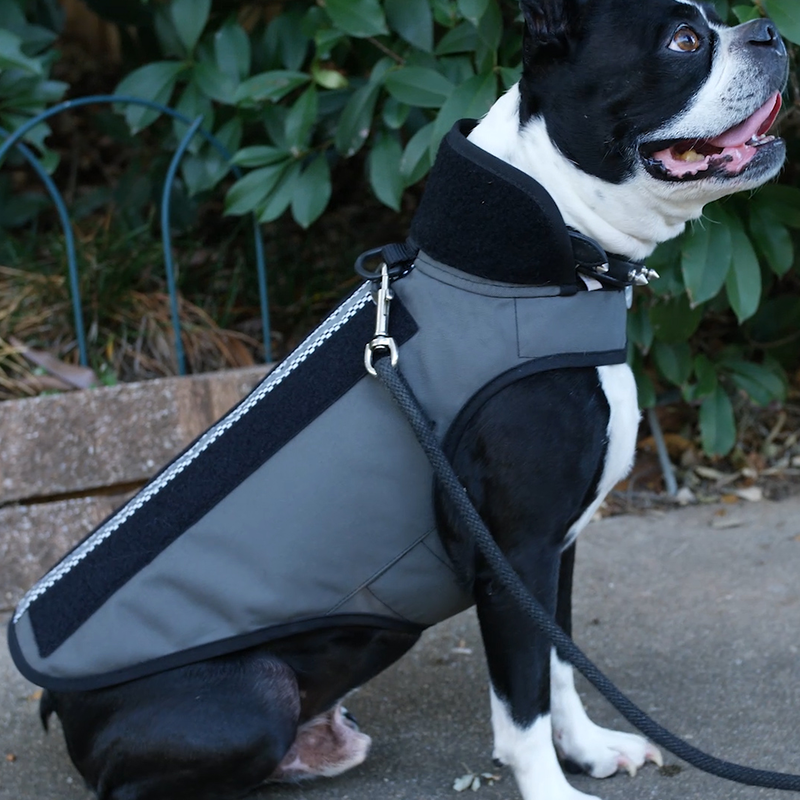 Predator Vest™ is tough enough to withstand a bite from a determined coyote, but flexible enough to keep your dog comfortable and built to allow him to do his business while wearing it. It also has a place to attach a leash to keep him close. It’s a harness, protection, and Halloween costume rolled into one! And when you make your purchase from the iHeartDogs store, you’ll be feeding 25 shelter dogs with your pet’s halloween costume! So what is your dog going to be for Halloween this year? We suggest he be protected from predators! Coyotes may be a threat to our pets, but they’re living creatures and should not be attacked. Report any coyotes you see, even those that may seem friendly, to your local animal control. For more information, see 5 Ways To Reduce Risk Of Coyote Attack.